In early 1940, Russia invaded and occupied eastern Poland. One and a half million Polish citizens, many of them veterans of the previous war, were declared enemies of Russia and torn from their homes. Deported first to forced labor camps in Siberia, they were eventually offered amnesty if they agreed to fight for the Russian Army. As the men fought, the women struggled to keep the rest of the family together, despite starvation, disease and further displacement. With no home or citizenship left in Poland, they sought safe haven across the globe. 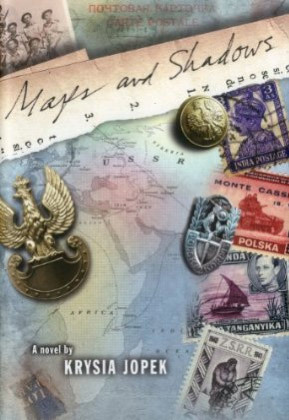 Reading at times like a wartime memoir, Maps and Shadows follows one family as they are sent first to Siberia and then to Uzbekistan, Iran, Palestine, Africa, England and finally the United States, in an effort to remake their home. Separated for much of the war, they each have their part to tell in the story: the father, Andrezej, ashamed of not being able to protect his family and first in line to volunteer for the Army; thirteen-year-old Henryk, who joins the Young Soldiers’ Battalion to get extra rations for his mother; Helcia, who hides a dictionary under her dress when they are taken, so that she’ll never forget how to say “hope” in Polish; and Zofia, the mother doing her best to hold everything together. Peppered with poetry from the margins of Helcia’s dictionary, this haunting book tells of a tragic and little-known chapter of history. It’s a slim volume, with more emphasis on characters than story, but well-researched. Heavily based on her own family’s experience, Jopek’s book is recommended to those who like their historical fiction autobiographical and real. The author, a poet, narrates a fictionalized biography of her family as her mother, father, and two siblings tell of their journey in war-time Poland. The story begins on a supposed idyllic family farm in pre-war Poland, surrounded by Ukrainian villages. Once Germany invades Poland from the West, Russia, by agreement with Germany, invades from the East. The Russians then round up Poles in their occupied areas and “resettle” them in what were essentially slave labor camps in Siberia. Through an agreement reached through British intervention, Polish slave laborers are released and the father joins the Polish army in exile in Palestine. The family, left behind, travels first to Tanganyika, then are finally transferred to a refugee camps in England. The family is reunited and as Polish DPs (displaced persons) find ultimate refuge in the United States. Disguised as a novel the story plays on the heartstrings, but does replicate the history of so many Poles, who were first subjugated by the Germans and then degraded by the Russian Communists. Accompanying the tale is a reading guide offered as a supplement, hence adding to the value as a teaching tool. Overall, this memorial, slimly characterized as a novel, is a terrifying experience given a very human face. Jopek… shows how very talented she is… I definitely recommend this book on several levels, especially for the writing.